The heart of the city pulsates in its Altstadt, the old town, where bustle and tranquility, history and modern life mingle in harmony. The little lanes with their narrow-gabled town houses and old churches are home to around 260 pubs, local and international restaurants, disco­theques and clubs, trendy boutiques and small stores, attracting a highly cosmopolitan clientele. The locally brewed top-fermented Altbier is consumed to the sound of live rock and jazz music in so many places that we can’t count them. Das Uerige (Website: www.uerige.de )is one of the most famous brew pubs in the city and you must stop by for a few beverages. The Historic Town Hall, whose oldest part dates back to the 16th century, is situated at Marktplatz. In front of it, the equestrian statue of the Elector Jan Wellem, focal point of the Marktplatz, was erected in 1711, and this symbol of Düsseldorf is today regarded as one of Germany’s most significant Baroque monuments. On Burgplatz the Schloßturm, the tower dominating the square, is all that remains of Düsseldorf’s palace which dated back to the 13th century and was destroyed by a fire in 1872. St. Lambertus Basilica, off Burgplatz, is also well worth a visit, its slightly twisted spire giving the 72 m high belfry a bent appearance. The Rhine embankment promenade has taken the place of a former through road, the heavy traffic now being channeled through a tunnel beneath. 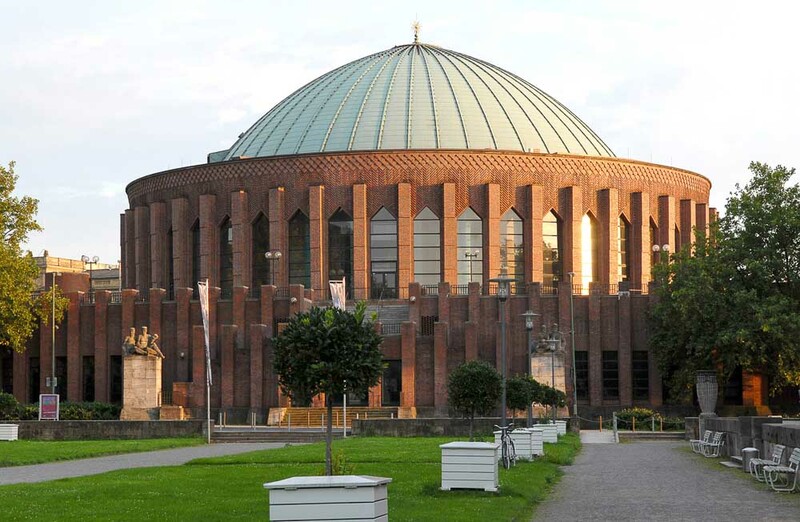 It was completed in 1997 – and has in a very short time become one of the most popular meeting points for Düsseldorfers and their guests. The old water-level marker to the south of the tower is one of the starting points for boat trips on the Rhine. From Burgplatz to the left, in the direction of the Rhine Tower, the gaze falls on the restored tide gauge dating from the Thirties. To the left of it are trendy street cafés. Then the old harbour with an ancient fishing boat comes into view. A few steps further on is the state chancellery, the seat of the Minister-President of the state of North Rhine Westphalia, and a bit further the circular building of the State Parliament of North Rhine-Westphalia, completed in 1988. Adjacent situated is the 80m high Stadttor (city gate), the bridge-like structure of yet another future landmark of Düsseldorf, seat of the Minister President of NRW and an office building with an outstanding architecture. 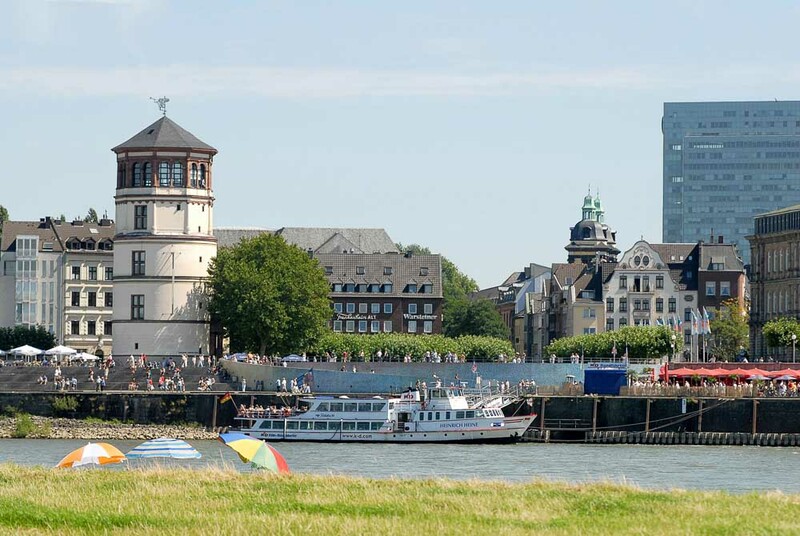 The Rhine Tower, not to be overlooked with its height of 234 m, boasts the largest decimal clock in the world and the most spectacular view across Düsseldorf, the Rhine bends and the region as such. The revolving Rhine Tower restaurant, at a height of 172 m, completes a full turn once an hour. For those who want to venture even further: via a small bridge one reaches the harbour area where Düsseldorf is setting a new creative highlight with the future media mile. Directly on Burgplatz is the free-standing castle tower, featuring elements of the Renaissance. It houses a beautiful shipping museum. Burgplatz is bordered on one side by sweeping steps leading down to the Rhine. They have fast become a favourite meeting place mainly for young people. To the right, following the flow of the Rhine, are the museums of the Ehrenhof complex, Tonhalle (the concert hall), and Rheinterrassen, a splendid venue for all sorts of festive events. The trade fair grounds are at walking distance, and medieval Kaiserswerth is just a pleasant cycle tour away. And while crossing the Rhine park on the way – why not take a break at one of the restaurant boats at anchor there…. 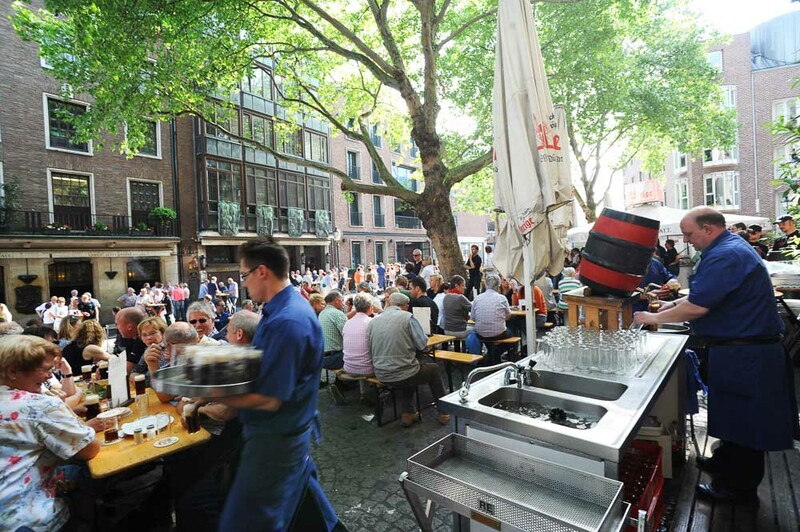 The former farmers market is now a gourmet’s paradise for Düsseldorfers and tourists (Mon-Sat). Heinrich Heine (1797 – 1856) is considered the most important German poet between Romanticism and Realism. He was born in the rear part of the property. Situated in the front building is the literature bureau and the literature café ‘Schnabelewopski’. Heine was the author of the Loreley song ‘Ich weiß nicht, was soll es bedeuten…’. 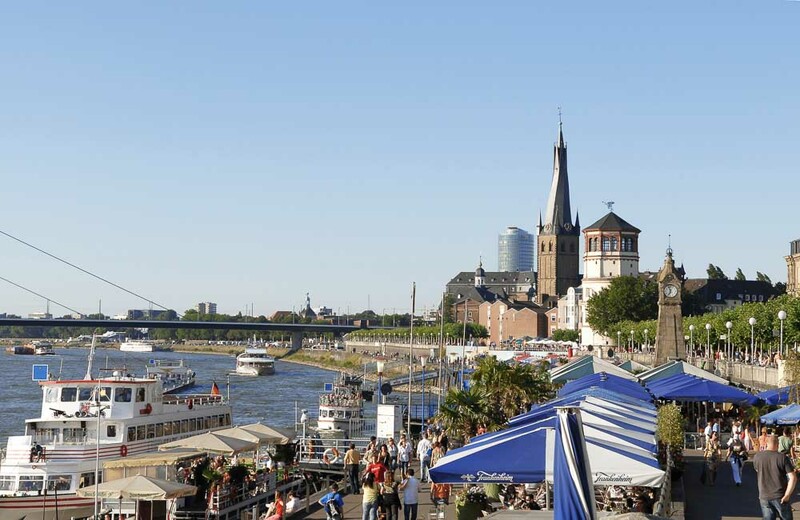 The Rhine embankment promenade with its rows of plane trees and many sidewalk cafés has brought the city closer to the Rhine again and in summer gives an almost Mediterranean flair to the riverside. It leads along the old town straight into the media harbour with its exciting architecture. The three buildings designed by Frank O. Gehry at the side of the harbour basin of Düsseldorf, the ‘Neuer Zollhof’, form a unique ensemble – an architectural masterpiece of its own kind. 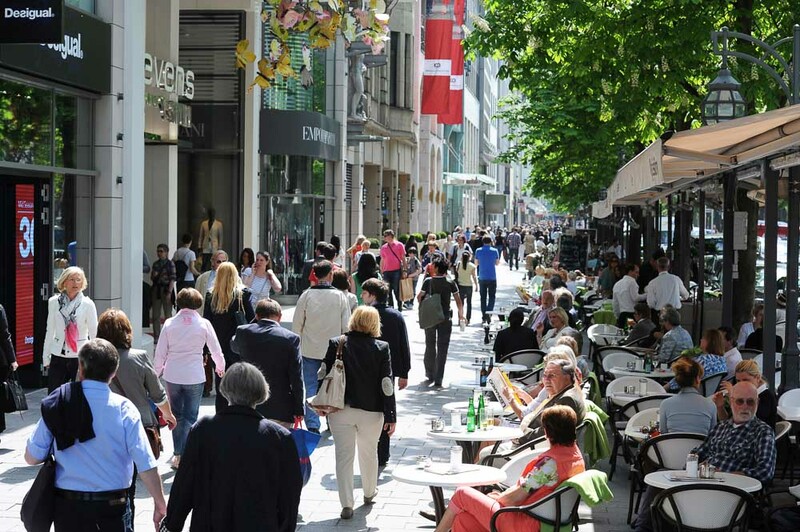 Kö is the short form of Königsallee – an exclusive, splendid boulevard featuring luxury shopping malls and flagship stores. 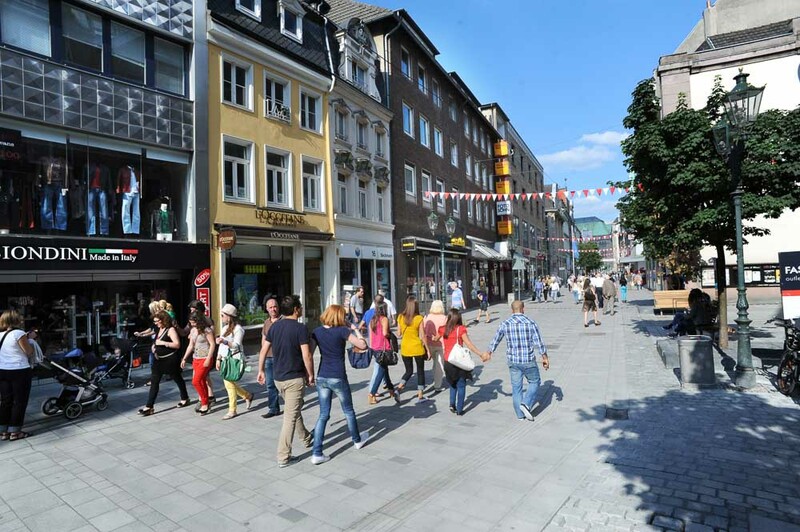 Worth to stroll is also Schadowstraße, the shopping street achieving the highest turnover in Germany. The Christmas markets in the old town and on Schadowplatz transform Düsseldorf’s centre into a Christmas wonderland, attracting many hundreds of thousands of visitors every year.